Oh, Black Jack you scoundrel...uh what? 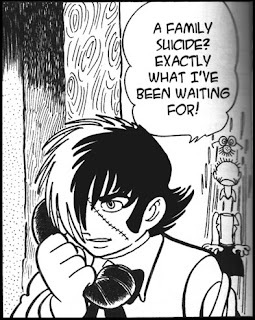 I was reading volume 9 of Black Jack when I came across this panel which made me literally laugh out loud. Out of context this is pure comedy gold. “A family suicide? Exactly what I've been waiting for!” Just what every doctor has ever wanted! Did Black Jack want his family dead? Or someone else's family dead? How often do you get a full family suicide? I'm not going to say it was translated wrong, because hey I don't know Japanese, but this just seems so...well wrong. Didn't someone translating it or editing it go “Hey maybe this isn't a good idea?” This had to pass though a few hands before print. Ack, this weekend ended up being a bit more crazy then I thought it would be. While I started work on a review for another title last week, I didn't have time to do it. It's something that I want to be awesome when done so it might be a couple weeks before it surfaces. As next weekend I will be at PAX East playing the video games, so most likely I won't be posting.